There is something so rich-looking about fire opal Swarovskis — which is probably why I use them in several of my pieces. 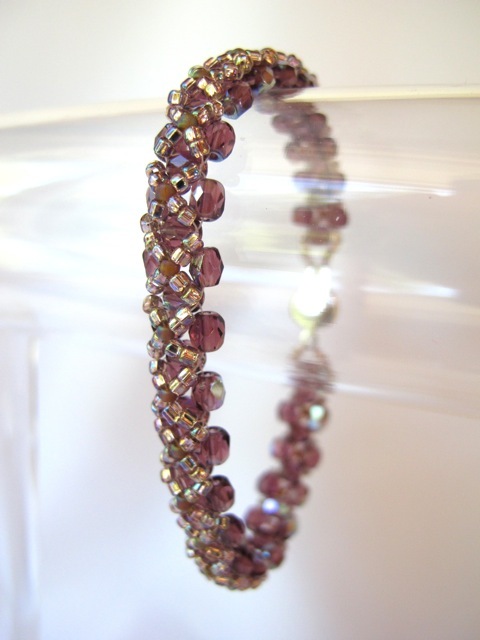 This bracelet is done in diamond stitch. I’ve seen the design using faceted glass beads but none with bicones — of the two I prefer the bicone style. Categories: Bracelets | Tags: beadweaving, diamond stitch, magnetic clasp, Swarovski | Permalink. These bracelets are deceptively dainty. In everyday use they’re the Energizer Bunny of jewelry. 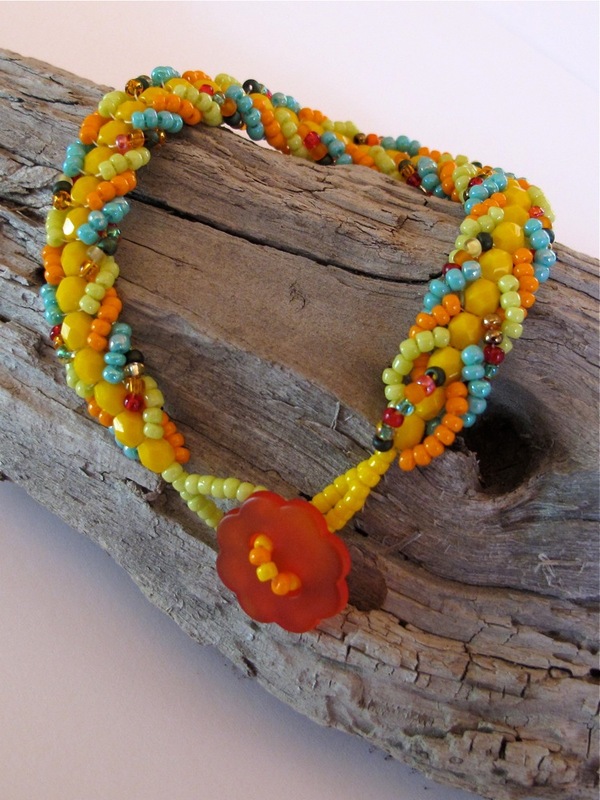 I used oh-so-tiny size 15 beads on Fireline with a pearlized glass bead and beaded loop clasp. The stitch? Basic netting. Looking for something you can wear in the pool? the shower? the hot tub? These will do the job — and you’ll look good at the same time. I made my first one 4 or 5 years ago and it’s still going strong. Luv it! Categories: Bracelets | Tags: beadweaving, netting | Permalink. I work mostly with seed beads but once in a while large beads come calling. These burgundy glass cubes have been in my stash for several years. Loved the colour, just didn’t know what to do with them. So I set myself a challenge: do something, anything, with them. Out came some size 6 beads, some Fireline and I set to work with no particular plan in mind. Of course when you don’t have a plan you don’t know where you’ll end up. After several false starts I began weaving a long line, interspersing cubes among the smaller beads. Then I tried doubling back on the original strand, adding more size 6’s but weaving into the original cubes. 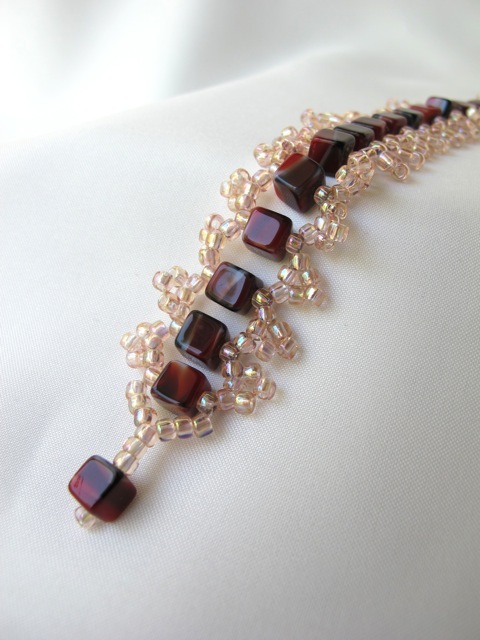 Categories: Bracelets | Tags: beadweaving, right angle weave | Permalink. Love this colour! And with Swarovski crystals, well, what can I say. They’re gorgeous. I seldom use magnetic clasps on my work because my experience with them hasn’t been good. They catch on shopping carts, door handles and cutlery. Before you know it, your bracelet is gone. I’ve used keeper chains but that’s only a partial solution. Last winter I discovered magnetic clasps that work well. Unlike most such clasps where the two halves simply slide past each other, this one is constructed differently. The magnet is actually inside the clasp. In the photo below, the magnet is the small “bump” on the righthand half. It fits snugly into the hollow on the lefthand portion. Screw the two halves together and you’ll notice hardly any magnetic attraction. How does this happen? I started off making a necklace when the beads (which have a mind of their own) took a sharp turn and became a bracelet instead. Categories: Bracelets | Tags: beadweaving, button clasp, flat spiral sitich | Permalink.